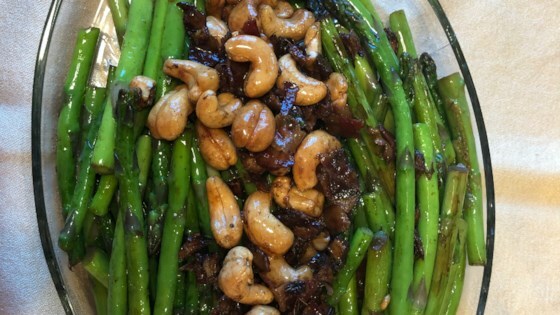 "I didn't think I liked asparagus until trying this recipe at a Christmas dinner. Now I cook it for any special occasion and everyone oooh's and aah's when I say it's on the menu." See how to make a simple broccoli side dish with garlic and cashews. I thought this was just okay--I've had asparagus other ways that I have enjoyed much more. My husband really was disappointed in this recipe and thought it was a waste of good ingredients. Hubby really liked this. I added just one little clove of garlic and just a bit of freshly grated ginger...he ate it up quickly. (Me...not a fan of asparagus). Thanks for the post.